Viewing topic "Need HELP with my set up plssss"
oh and this might be a dumb question… but i have the line out (which are RCAs) of the Tascam audio inerface, going in to the monitors… I get sound, however at full volume its fairly loud, but not as loud as the rokits can go? any idea what im doing wrong there or is that just how it is??? If you want to just “Jam” on your Rack-ES with your Roland PCR-500, without your computer being involved, you’ll need to set your RACK to use the MIDI ports, and plug the MIDI OUT of the PCR to the MIDI IN on your RACK. I don’t know how the Tascam 122L works, but if it allows passive MIDI PASSTHRU, then you can go MIDI-OUT of the PCR to MIDI-IN on the 122L, then MIDI-OUT from the 122L to the MIDI-IN on the RACK. Then, when CUBASE is up and running, take the 122L out of PASSTHRU mode, and it can be used as a MIDI instrument in CUBASE. #1) I would go USB from the Rack ES to another USB port (in order to take advantage of Studio Manager; and Cubase’s ability to remember your setups). Next, go MIDI out from the Roland to either the MIDI in of the Rack ES, preferably (or the Tascam). yes my PC has 6 USBs. So i would like to utilise the studio manager apps also. now this set up above is simply for jamming without PC interference! Any ideas what im doing wrong? As I mentioned in my post, that will only work if the TASCAM supports Passive MIDI passthrough. so what are my other options? My main priority here is music production with cubase. So whats the best way to do that? ok so ive gone midi out of the roland midi keys to the midi in of the motif es rack… when i start cubase and try and use it i dont get a signal? I get the midi in and out bars (red and green bars on transport bar) activating… the multi button light flashes on the rack.. but no sound?? When i use a VST all is good, i can hear it no probs - but cant seem to get anything from the motif? As for the computer, I take it that you’ve put the Rack ES in USB mode… (whenever you ‘jam’ it needs to be in MIDI mode). 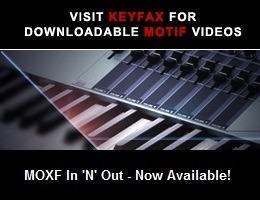 Have you setup the Motif’s MIDI ports in Cubase? ive got the midi out of the keyboard going to the midi in of the motif. the only way i can hear it is when i plug an audio cable from teh motif to the line in of the tascam audio interface. Using the midi cables along doesnt give me a signal for some reason..
not sure what to do! Not sure if this MIGHT be complicating things, but I didn’t notice anywhere above whether you’ve set your Motif Rack ES to MIDI=USB? That’s a setting in the Utilities so that your Rack is communicating midi signal on the USB line, rather than direct Midi cables in/out of the back of the Rack. This sometimes causes folks grief in getting things setup to their satisfaction (especially when using multiple Midi devices), so just thought I’d add this seemingly small suggestion.